The Keepy interactive scrapbook app is a keeper. There’s a lime green folder in a top drawer in our kitchen that is spilling over with paper: artwork, drawings, little wobbly letters that are getting less wobbly day by day. I’ve learned to let go and throw some things away, but the rest of it? Let’s just say some sorting is needed. 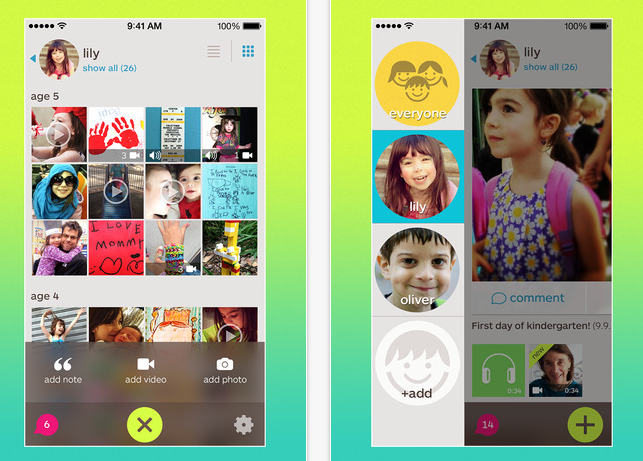 That’s why I was pleased to hear about Keepy, a new interactive scrapbook app that is surely what a lot of you have been looking for. 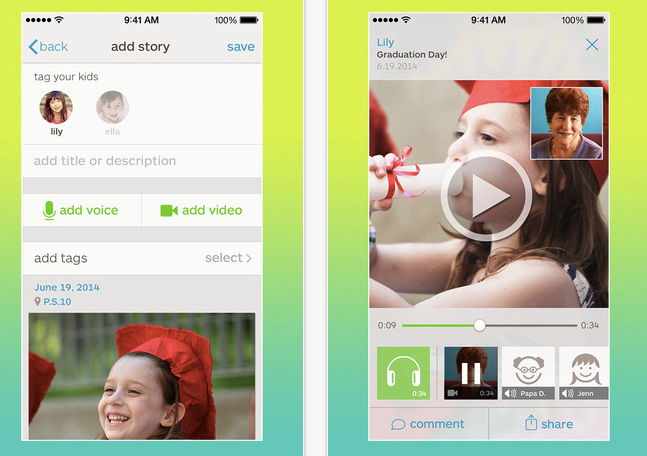 To bring your memorable moments to life, you can add photos or layer in audio and video narration. Or what I love is having your kids record their thoughts about the soccer game or the lost tooth, and hold onto that experience — and their tiny voices — forever. Kind of like the Shadow Puppet app only with way more functionality. A great feature is that you can create a timeline for every member of the family (including Grandma and Grandpa) and have a dynamic family tree ready to be enjoyed — and expanded and changed — whenever you please. Smart, seeing as how that’s how families work. Plus, you can organize and view all of it directly on your smartphone, and autosync to Dropbox for extra-safekeeping, in addition to storing photos on the Keepy servers. So perfect considering we always advise readers to back up photos in three places. Another nice aspect to the Keep app is that you get to choose with whom and how you share your timelines, be it via email, the Keepy website, or your smartphone. In other words, no worries that your aunt has refused to join Facebook, or your grandfather likes his cell phone but never touches the Internet. They too can “fan” your kids, see everything on the timeline, and even leave their own voice, video or text comments. Only in what seems to be a more secure, private place than Facebook. Of course there is a limit to what you get for free; 31 entries a month are all yours, but after that you need to pay a few bucks a month. Still, it’s very reasonable for what you’re getting. It’s so fun and easy, it might be time to scrap the actual scrapbook and step into the future with this new, enhanced way of telling your family’s rich and wonderful story. Keepy is a keeper. The Keepy scrapbook app is a free download on iTunes, Google Play and Kindle. There’s a free photo storage plan that gives you 31 “Keepies” or entries per month on the web site’s server; a premium plan with 101 Keepies per month for $1.99; and an unlimited plan for $2.99.